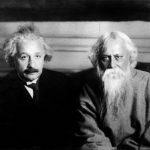 That which the Vedantists describe as unmanifest and infallible, that which is known as the supreme destination, that place from which, having attained it, one never returns—that is My supreme abode. The supreme abode of the Personality of Godhead, Krishna, is described in the Brahma-samhita as cintamani-dhama, a place where all desires are fulfilled. The supreme abode of Lord Krishna, known as Goloka Vrindavana, is full of palaces made of touchstone. There are also trees, called “desire trees,” that supply any type of eatable upon demand, and there are cows, known as surabhi cows, which supply a limitless supply of milk. In this abode, the Lord is served by hundreds of thousands of goddesses of fortune (Lakshmis), and He is called Govinda, the primal Lord and the cause of all causes. The Lord is accustomed to blow His flute (venum kvanantam). His transcendental form is the most attractive in all the worlds—His eyes are like lotus petals, and the color of His body is like the color of clouds. He is so attractive that His beauty excels that of thousands of Cupids. He wears saffron cloth, a garland around His neck and a peacock feather in His hair. 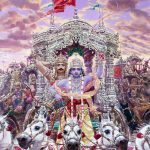 In the Bhagavad-gita Lord Krishna gives only a small hint of His personal abode, Goloka Vrindavana, which is the supermost planet in the spiritual kingdom. A vivid description is given in the Brahma-samhita. 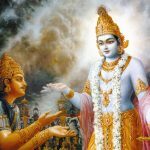 Vedic literatures (Katha Upanishad 1.3.11) state that there is nothing superior to the abode of the Supreme Godhead, and that that abode is the ultimate destination (purushan na param kincit sa kastha parama gatih). When one attains to it, he never returns to the material world. Krishna’s supreme abode and Krishna Himself are nondifferent, being of the same quality. On this earth, Vrindavana, ninety miles southeast of Delhi, is a replica of that supreme Goloka Vrindavana located in the spiritual sky. 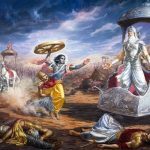 When Krishna descended on this earth, He sported on that particular tract of land known as Vrindavana, comprising about eighty-four square miles in the district of Mathura, India. The word avyakta of the previous verse is explained. That which is avyakta is without destruction: Narayana. As the sruti says, eko narayana asin na brahma na ca sankarah: one Narayana existed, and not Brahma or Siva. Attaining my eternal form (mama paramam dhama), they do not return. 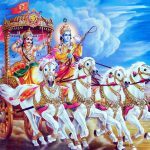 Lord Krishna now gives the evidence for His avyakta or unmanifest being aksara or imperishable having neither birth or destruction and impossible to be perceived by the mind and senses. The Mundaka Upanisad I.I.VII states: Similarly from the aksara this creation comes into being. The aksara is declared to be paramam gatim the supreme goal of human existence and the ultimate destination. The Katha Upanisad III.XI states: There is nothing higher than the Purusha. He is the ultimate reality and the paramam gatim. The proof of it being the supreme goal is verified by the words na nivarttante meaning one never returns again to the material worldsonce they attain Lord Krishna’s supreme dhama or abode. The six causative case by the word mama meaning my is used in the sense of identity as when one states Rahu’s head which is all that remains of Rahu, it means only that. Therefore Lord Krishna, Himself is the paramam gatim and no other. This is the purport. The avyakta the unmanifest and aksara the indestructible is the resplendent Supreme Lord, Krishna Himself, upon whom attaining there is no more returning to samsara the perpetual cycle of birth and death. The Garuda Purana states: The avyakta is the Supreme Lord Himself. It shows the use of the word dhama or abode as also denoting the resplendent form of the Supreme Lord. Showing that the resplendent Supreme Lord’s form and abode are both indicated such are the confidential meanings understood by those of spiritual wisdom. avyaktaḥ — unmanifested; akṣaraḥ — infallible; iti — thus; uktaḥ — is said; tam — that; āhuḥ — is known; paramām — the ultimate; gatim — destination; yam — which; prāpya — gaining; na — never; nivartante — come back; tat — that; dhāma — abode; paramam — supreme; mama — My.